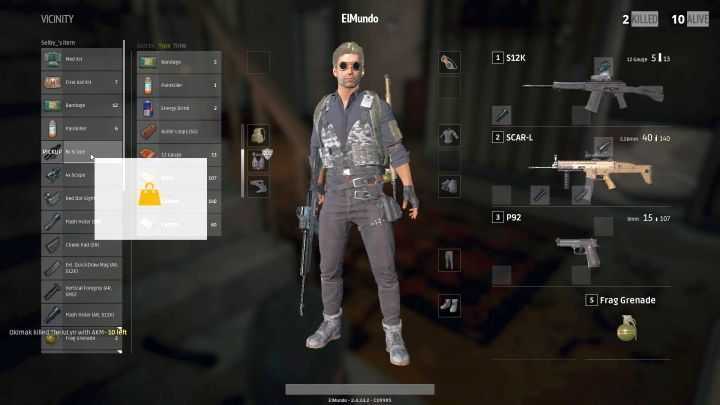 n Playerunknown’s Battlegrounds, it is possible to modify the majority of weapons. You have a selection of clips that affect the number of bullets or the reload speed, or several optical sights. Also, you can attach a silencer that muffles noise of your weapon, when fired. Players used to, e.g. silencers in Counter-Strike will be surprised, because silencers here do not muffle weapons to such an extent. Silencers in Playerunknown’s Battlegrounds have more in common with ones used in the real world. Of course, they muffle gunshot noises, but they are not as effective as in the abovementioned game, or action movies. The enemy within several, several tens, or even several hundred (in the case of assault and sniper rifles) meters away will still hear the noise and they will use that to assess your position. Situations, where you fire at an enemy a dozen-or-so meters away, who does not know where the shots come from, simply do not exist here. Silencers can be attached to the majority of handguns, SMGs, assault and sniper rifles. What is more, there is one attached to VSS sniper rifle by default and it cannot be removed. The below table presents information on distances over which enemies will hear you, with and without silencer. As you can see, with the exception of handguns, submachine guns and VSS, the enemy will be able to guess the direction you are shooting from over a considerable distance. This does not mean, however, that silencers are useless – quite to the contrary! Audibility in the battlefield is affected by many factors, such as other players, firing, or using vehicles, and even weather conditions (rain). Even if you are using a suppressed weapon over a distance shorter than specified in the table, you still make it more different for the opponent to find you, which may increase your chances of survival. Handguns in Playerunknown’s Battlegrounds often make the first firearm that you obtain and which you often use in the first seconds of the game. Firearms of this group play, somewhat, a role complementary to the weapons – they are used at the beginning of the game and are then replaced by the main weapon that is more powerful, has a larger clip and/or is effective over a longer distance. It is a good idea to use handguns appropriate for your skills. there are 4 handguns in the game – P1911, P92, P18C and R1895. The below table provides information on all weapons in this group – damage dealt, clip size ammo type and available firing modes. Note – damage provided in the table refer to a player hit into the chest and not wearing any protection. Depending on the armor and the hit body part, damage will be different – to learn more, see chapter entitled “How to minimize damage taken”. Handgun should be perceived as a side weapon, rather than the main weapon. If you have on you a weapon that will work better for the current situation (shotgun and SMG for short distance, assault rifle and sniper rifle for medium and long distance), do not even think of using the handgun. Handgun is worth using after you have depleted ammo in your main weapon’s magazine. It is better to take the odds and try to kill the enemy with the handgun, than waste several seconds on reloading the weapon, when you become defenseless. Match the handgun with your own preferences and skills. If you are a good shot, and the majority of the shots you fire reach their target, it is a good idea to obtain P1911 or R1895. Both of these have very small clips, but they deal high damage (higher than some assault rifles and sniper rifles!) – and they are, therefore, effective in the hands of a player that can shoot well. If you are a poor shot, it is better to use P92 or P18C – the more bullets the higher that chance of hitting the target. Handgun silencers are extremely effective – the enemy will not be able to hear you from the distance of over 100m (and he will have difficulty hearing you within the distance). Submachine guns (SMG) are perfect for short distance (and for medium distance, with a bit of practice). Weapons in this group combine characteristics of handguns (their damage and accuracy over short distance) and of assault rifles (rate of fire and clip size). They are extremely effective in urbanized areas and indoors. In such situations, they can deal the highest damage of all weapons (with the exception of point blank shotgun fire). However, they have two shortcomings – their effectiveness drops significantly with distance from the enemy and they deplete ammo quickly and therefore, you have to keep an eye on the number of available rounds. SMGs are perfect within enclosed areas. In the game, there are 4 SMGs – Micro UZI, UMP9, Vector and Tommy Gun. The last one, Tommy Gun, can only be obtained from a supply crate. The below table presents information on all the weapons in this group – damage dealt, clip size, ammo type, and available firing modes. Note – the above damage refers to damage taken by the opponent hit in the chest, without an armor. Damage dealt differs, depending on the armor type and damaged body part – See the chapter entitled “How to minimize damage taken”, for more information. Submachine guns are extremely effective over short distance, in urbanized areas and indoors. Their rate of fire, damage dealt and accuracy over short distance make this type of weapons unparalleled, when it comes to damage dealt. It is a good idea to use this type of weapons within enclosed areas, among numerous buildings, or indoors. If the fighting takes place in a vast, open area, it is better to swap SMG with assault rifle or sniper rifle. SMG silencers are extremely effective – the enemy will not be able to hear you from the distance of over 100m (and he will have difficulty hearing you within the distance). While using Micro UZI and Vector, keep an eye on number of rounds left in the clip. Both of these have sky-high rate of fire and, as a result, you can deplete ammo in your clip in less than a second! Tommy Gun is difficult to obtain, because it can only be found in supply drops. Still, this is one of the most interesting weapons in the game. It combines characteristics of handguns and SMGs – it deals high damage and there are as many, as 100 rounds in the magazine. designated marksman rifles (DMR) are weapons that combine characteristics of assault rifles and sniper rifles – they are a bit less powerful and have shorter range than sniper rifles, but they surpass assault rifles here. At the same time, they have slightly bigger clips and much higher rate of fire than sniper rifles. These weapons are perfect over short and medium distance (and over long distance, with a bit of practice). Still, they have several shortcomings. The small clip (10 rounds) requires the player to be highly accurate, to be effective. The same goes when the weapon is used over long distance – you require 2-4 hits (depending on the enemy’s armor) to kill and, as a result, you cannot miss. There are two weapons of this type available in the game – Mk14 EBR and SKS. The below table presents information on all weapons in this group – damage dealt, clip size and ammo type, czy available firing modes. the above damage refers to damage taken by the opponent hit in the chest, without an armor. Damage dealt differs, depending on the armor type and damaged body part – See the chapter entitled “How to minimize damage taken”, for more information. DMRs are powerful weapons that can be used as assault rifles and sniper rifles, provided that they are equipped with appropriate attachments. It is usually the case that versatile weapons do not exceed neither assault rifles nor sniper rifles, in terms of their effectiveness – the former are better over short and medium distance, whereas the latter are better over long distance. Both of the weapons in this group have small clips (10 rounds), especially when you consider their rate of fire. While conducting auto fire, you can deplete ammo within a second. Keep that in mind, especially while fighting at close range. As soon as you obtain a decent assault rifle, or any sniper rifle, do not hesitate to swap the DMR for the other weapon – in both cases, you will only gain from that. Sniper Rifles in Playerunknown’s Battlegrounds are the most-wanted weapons. They are quite rare and difficult to obtain (and some of them are available from supply drops) and they require a decent scope for full functionality. An experienced player, using this sort of equipment, is capable of wreaking havoc all around the map. The majority of sniper rifles in the game deal very high damage (while targeting the head, you can eliminate the enemy in one shot, unless he is wearing a tier 3 helmet) and it is effective over a very long distance, which makes it perfect for vast, open areas. However, with the exception of VSS, their rate of fire is very low, which makes them ineffective over short distance, or indoors. It is a good idea to loot corpses of enemies, because they may have a sniper rifle on them. 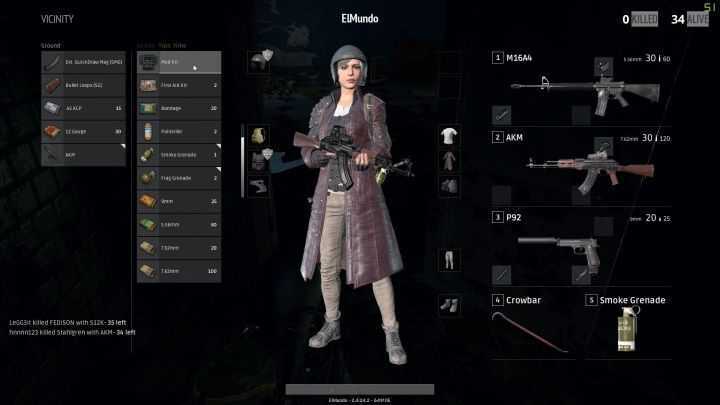 In the game, there are 4 sniper rifles – Kar98, VSS, which can be found around the map, and M24 and AWM, which you can find only in supply crates. The below table presents information on all weapons in this group – damage dealt, clip size and ammo type, and available firing modes. Sniper rifles are perfect for both medium and long distances – high damage dealt and accuracy will allow you to eliminate the enemy with ease. At the same time, small clip and low rate of fire will not be that problematic. Weapons of this type are completely useless over short distance, in urbanized areas and indoors. Killing any opponent is nothing short of luck (unless he only has several HP points or you hit the head). In the majority of cases, you will only have one shot to kill the opponent. This is why it is better to switch to any other weapon, while fighting in such conditions – handgun, SMG or even a melee weapon are much better. These weapons become even more effective after you have attached a decent scope (x4, x8 or x15). You can conduct fire without a scope, but precise optics increase effectiveness. Silencers, on the other hand, are not that important here, because they doo not suppress the weapon as much as they do in the case of assault rifles or handguns and submachine guns. If you spot an enemy and you carry a sniper rifle, it is better to take a good aim before you fire. Hitting the enemy into the legs or torso is probably not going to kill him, but in the majority of cases, hitting the head is. While using sniper rifles, it is a good idea to obtain additionally a weapon for short and medium distance combat. Assault rifle or SMG are perfect here. Assault rifles are, inarguably, the most versatile weapons in Playerunknown’s Battlegrounds. Weapons of this type bridge the gap between LMGs and sniper rifles – they have large magazines, deal high damage and have high accuracy that is surpassed only by that of sniper rifles. This makes these weapons virtually flawless – they are perfect over any distance and, with appropriate scopes, they can play the role of a makeshift sniper rifle) and in nearly any situation. Obtaining an assault rifle at the beginning of the game will let you survive the first several minutes of the game. In the game, there are 5 assault rifles available – M416, M16A4, AKM, SCAR-L and Groza, where the last one can only be obtained from supply drops only. The below table presents information on all weapons in this group – damage dealt, clip size and ammo type, and available firing modes. Assault rifles are weapons that you should search for in the first place – finding one should be your priority. These weapons can be used for combat over short and medium distances, and M416 and SCAR-L are also efficient over long distance, provided that they are equipped with appropriate optics. If you carry one or two weapons of this type, it is a good idea to carry an additional optics. Thanks to this, you can attach a 4 or x8 sight to your weapon to fight efficiently over medium and long distance and, if necessary, attach laser or a reflector sight for indirect combat. Assault rifles gain in effectiveness after you attach a silencer. Thanks to this, your audibility will be decreased by a half (from 700 to 350 meters). Carrying two assault rifles is a neat idea, especially that some weapons (such as AKM and Groza) are much better over medium distance, due to lower accuracy and higher damage dealt, whereas the remaining ones are better over long distance. It is best to carry one weapon firing 7.62 rounds (AKM or Groza) and one firing 5.56 (M16A4, M416 or SCAR-L). Remember about the firing mode switch. Single fire is perfect over long distance, when you need to take an accurate aim. At the same time, auto-fire is much more effective over shorter distances. Also, remember that M16A4 does not fire in auto mode – instead, you can fire the weapon in Burst mode. Light machineguns (LMG) are weapons that somewhat combine characteristics of submachine guns and assault rifles. Their rate of fire is higher than in the case of assault rifles, they deal slightly more damage and have larger magazines, but their accuracy is lower. Thanks to this, they are perfect over short and medium distance and slightly less effective over long distance. However, there also are downsides of these weapons. The first one is the magazine size and rate of fire. With continuous fire, you can deplete the entire magazine. Fans of weapon modification will not be satisfied, because you can only attach sights to this weapon. So far, there only is one weapon of this type available in the game – M249, which can only be obtained from supply drops. The below table presents information on this weapon – damage dealt, clip size and ammo type,and available firing modes. Note – the above damage refers to damage taken by the opponent hit in the chest, without an armor. Damage dealt differs, depending on the armor type and damaged body part – See the chapter entitled “How to minimize damage taken”. Light machineguns are the most effective over short and medium distances, but their effectiveness drops with distance to the target. LMGs cannot be fitted with a silencer, so you can well forget about being stealthy, while using this weapon. The only LMG available in the game is M249, only with automatic firing mode. This may be problematic, if you want to engage an enemy far away. Just like above, you can only attach optics to this weapon – you can neither upgrade by a larger clip or a different nozzle. Weapons of this type devour ammo at a high rate, so you will have to restrict yourself and not fire long bursts. Shotguns in Playerunknown’s Battleground are effective only over short distance, where the closer the target, the better. Weapons in this group deal virtually the highest damage, of all weapons – hitting an enemy from a distance of several meters usually ends in a kill, frequently also when the enemy is wearing armor. However, there are two downsides to these weapons. The first one is accuracy – the weapons are useless for combat over distance exceeding 15-20 meters, because their damage dealt drops drastically. The other issue is that each shell fired is worth its weight in gold – if you fail to kill the enemy with several shells, most probably you will die, because reloading these weapons takes forever. Weapons in this group are perfect over short distance and they are lethal indoors. In the game, there are 3 shotguns available – S1897, S12K and S686. All of the shotguns can be found around the map and none of them is to be searched for in supply drops. The below table presents information on all weapons in this group – damage dealt, clip size and ammo type, czy available firing modes. Note – the above damage refers to damage taken by the opponent hit in the chest, without an armor. Damage dealt differs, depending on the armor type and damaged body part – See the chapter entitled “How to minimize damage taken”, for more information. ozdziale “How to minimize damage taken”. Shotguns are lethal over short distance and indoors – short distances allow you to hit the target with more pellets, which usually ends in the enemy’s death in one shot. These weapons are completely useless over distances longer than 30-40 meters – pellets are then sprayed all over the place and they deal virtually no damage. You can attach any sights to these weapons, but this defeats the purpose – attaching x8 sight makes no real sense. It is a good idea to use these weapons in confined areas and indoors. If fighting takes place in a vast open area, it is better to switch the shotgun to an assault rifle or sniper rifle. It is necessary that you keep an eye on the number of available shots. Reloading takes forever (shotguns are loaded with shells one-by-one), as a result of which, you can end your life right after you run out of shells. Try to erload the weapon always when you feel safe. They have been developed thousands of years ago and, it may seem that they are out of place in the modern battlefield. However, they are used by some units even today and therefore, they are also present in Playerunknown’s Battlegrounds. Crossbow is an unique weapon – there is only one type of this weapon available in the game and, this is why it is simply known as Crossbow. What is characteristic for this weapon is its high precision. It deals some of the highest damage in the game and bolts it fires make virtually no noise, apart from a faint hiss audible over a dozen-or-so meters. However, there also are downsides to the crossbow. The range of the weapon is strictly limited and it is only effective over medium distance (300-400 meters) at best, and after each shot you take, the weapon needs reloading which takes several seconds. Crossbow is a unique weapon and is effective only in some situations. 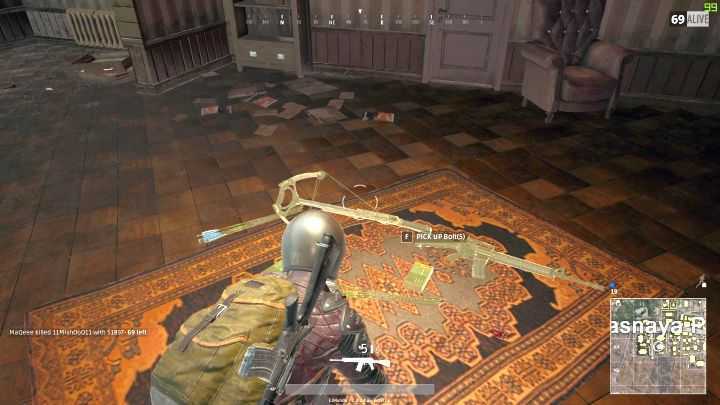 In the game, there is only one crossbow available. The below table presents information on this weapon – damage dealt, clip size and ammo type and available firing modes. Crossbow can be used over medium distance (150-400 meters). The only problem over short distance is the single bolt to fire, which requires you to reload and become vulnerable to enemy fire, after each shot you take. Over larger distances, however, accuracy drops. This weapon is highly context-dependant. It is perfect for stealthy elimination, because firing it makes virtually no noise (the enemy will not be able to hear you from a distance of a dozen-or-so meters), and if accurate, a single shot can eliminate the enemy. The downside is the fact that it is effective over medium distance and it takes up one slot for the main weapon – if you find any assault rifle or sniper rifle, it is much better to replace the crossbow. 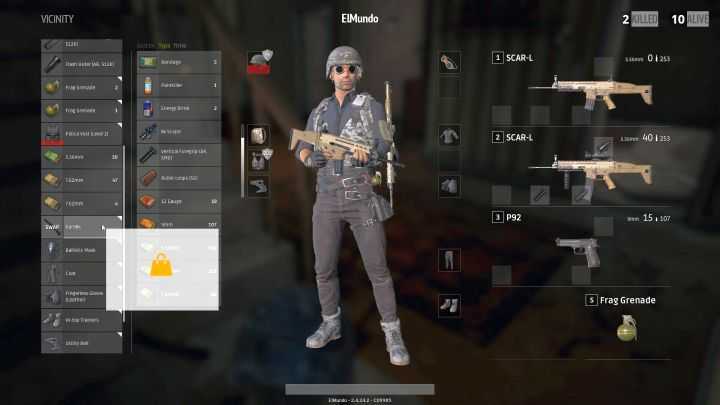 Considering the peculiarities of gameplay in Playerunknown’s Battlegrounds (which is mostly about exchanging fire over long distance and generally depending on guns), the melee weapons aren’t staggeringly efficient – it requires getting behind the player and hitting them once (if you hit the head) or even five times (depending where you hit and what’s the armor), and being exposed to their machine fire. Use the melee weapons only as the last resort – if you’re out of ammo or you haven’t found a proper weapon yet. However, if you’re good at sneaking and you manage to get them in the head, you’ll be able to kill most enemies with one or two hits, event if they have level 3 helmet. Melee weapons are pretty efficient indoors. Note – these values are only true for enemies who don’t have armor, hit in the head or torso. Depending on their armor and the part they get hit in, the damage will vary – more info on that in the chapter called “Reducing Damage”. Use melee weapons as a last resort. If you still have any sort of firearm, use it. In order to get an enemy with one of the above weapons, you need to close in on them, which is always risky. If you’re able to sneak around the enemy and you’re sure they’re not aware of your presence, you can try a melee weapon – each one of them deals pretty good damage, and if you manage to get a headshot, the enemy’s as good as dead. These weapons cannot be in any way modified. 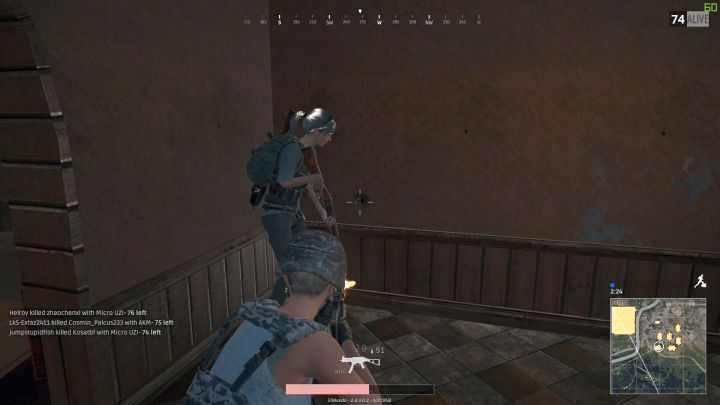 The Pan is the best available melee weapon; not only because of the damage it deals, but also the defense it provides – the pan can be used as a shield against bullets. Oddly enough, the pan can stop any weapon – even the most powerful sniper rifles and shotguns. No shooter game would be complete without grenades and some other stuff to throw. Playerunknown’s Battlegrounds is no exception; grenades are scattered all over the map and fall into four categories. They also provide more tactical possibilities – you can use them to intimidate enemies, smoke them out or clear a building. An enemy hit with a flash bang, completely exposed. – Direct damage: if it doesn’t kill, it leaves the victim severely wounded. – Sets enemies on fire, dealing DPS (Damage Per Second). – Generates thick smoke screen, which can obstruct the vision of your enemies or conceal your own movement. – A player that’s been hit won’t see and hear anything for a few seconds. The effects of this grenade are not mitigated with environmental obstacles. Note – the table doesn’t contain info on damage, because there is none available – not in the game, not in the dankest corners of the Internet. The frag grenade deals more damage if it explodes closer to the player; the Molotov cocktail sets enemies on fire and deals some damage over the few seconds that follow. The two remaining grenades do not inflict any damage at all. Considering the peculiarities of gameplay in Playerunknown’s Battlegrounds (which is mostly about exchanging fire over long distance and generally depending on guns), the grenades should be saved for later on in the game. The grenades are very effective if you need to smoke someone out from their cover. Even if you throw a smoke grenade and it lands near a player, the will – most of the time – take to their heels because you can never be sure what kind of grenade landed at your feet. They’re also great for clearing buildings, especially single-floor houses. 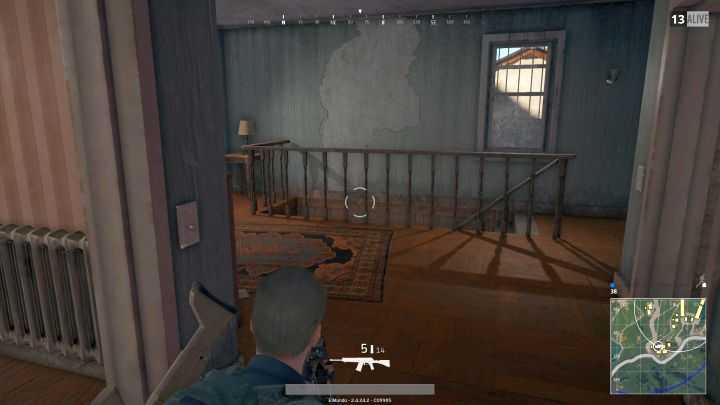 A well-placed grenade can cover most of such a house with it’s power, so if the enemy doesn’t die, they will be severely wounded and forced to retreat, which gives you the initiative. You can either toss the grenade right away and they will explode after around 5 seconds, or “cook” them a bit by holding the throw button – the longer you hold it, the shorter it will take from throwing it to explosion. Don’t overdo it, though, or it will explode in your hand. Press 5 on your keyboard to select a grenade. You can also switch grenades by tapping the same key. Apart from dozens of weapons, grenades and ammunition, you can also find items in the game that are not used to damage your opponents. Among those are healing objects (Bandage, First Aid Kit, Medkit), booster items (Energy Drink, Painkiller, Adrenaline Syringe) and one purely utility canister with petrol (Gas Can). The canister function is quite obvious – it is used for refueling the vehicle (right-click on it when you are inside the vehicle) and the healing and supportive objects are described in more detail in chapter “Wound treatment and boosting the character”. Medkits are some of the most valuable items in the whole game, but all medicines are useful during the game. – Restores 10 health points in a few seconds. It can cure up to 75 health points. – Restores 75 health points. It can cure up to 75 health points. – Restores all health points. It can cure the character to full health. – It strengthens the character by adding 40 Boost points – Boost points make the character automatically regenerate health and move faster. Health regeneration can restore the health points of the character up to the maximum. – It strengthens the character by adding 60 Boost points – Boost points make the character automatically regenerate health and move faster. – It strengthens the character by adding 100 Boost points – Boost points make the character automatically regenerate health and move faster. – Used to fill the vehicle’s fuel tank. All you need to do is activate the item in your equipment when the vehicle is not moving and it will be refueled. You have to collect all boosting items that you see. You can never know when the meds will come in handy (especially the MedKit). The stims are useful at all times, but they become really valuable during the endgame, when additional regeneration or movement speed can mean the difference between life and death. Adrenaline Syringe is only available in supply drops. The rest of the items can be found anywhere in the world. If you’re not planning to use a car, there’s no point taking the gasoline with you in Gas Cans. They take up space in your equipment, which might as well be utilized for something useful. 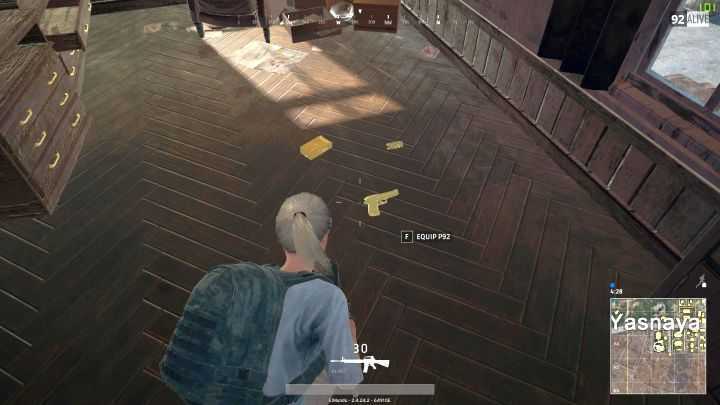 If you enter a building and see a MedKit right in the middle of the room, don’t immediately jump ahead to grab it – see if it’s not a decoy. Some players leave such items in order to distract others and get an easy kill. Another group of items that are not used directly to fight the enemy are vests and helmets. They are used to reduce the amount of damage received from the enemy, by shielding the torso and the head of the character. These objects are divided into 3 tiers – the higher the level, the better the protection and damage reduction as well as the strength of the object itself. 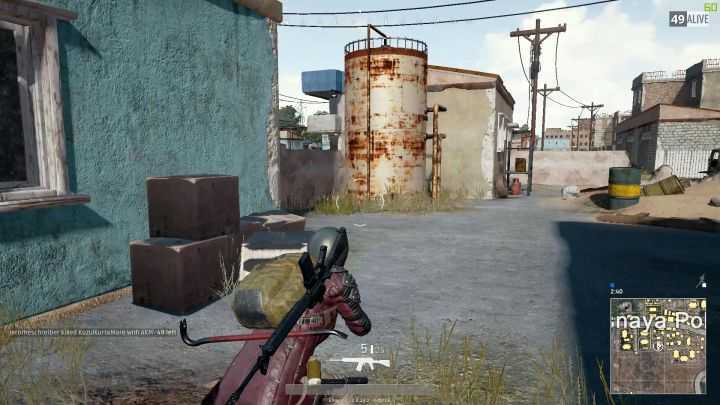 A vest and a helmet are some of the items that need to be picked up as soon as possible – even the simplest armor of level 1 will reduce the amount of damage received by 1/3, allowing you to survive one or two additional shots. The helmet, in turn, will allow you to survive some headshots – otherwise, a headshot from the weakest weapon will do you in. Vests and helmets have a durability index in the upper right corner of the icon. There are only 3 types of vests helmets in the game. Below you can find a table containing info regarding these items – percentage damage reduction, durability, and additional effects. Obtaining any helmet and vest is an absolute priority. You have to get them ASAP, or you will be as good as dead. The poorest vest will reduce the damage by 30%, same as a helmet. Additionally, even the worst helmet will ensure you survive a blow to the head. Remember that helmets level 1 and 2 don’t provide face protection – getting shot in the face is still worth 250% damage, which means you’re dead, friend. Only a level 3 helmet will reduce “face-shot” damage by 55%. Durability means how much damage an item can take before it goes to hell. Every shot or blow you take decreases the durability. Items can’t be repaired. If your vest or helmet are close to being destroyed, thing about switching them for something else, even it it’s a lower level item. The only exception is level 3 helmet – don’t take it off even if it has 1 durability. Playerunknown’s Battlegrounds doesn’t include crafting, but numerous mods allow you to customize every weapon to suit your needs. Installing the right sights, grips or barrels will let you alter the weapon damage, noise, increase accuracy etc. Every weapon has empy slots – these are for mods. The game contains several dozen different modifications to the weapons, which in this chapter are divided into 5 groups – barrels, grips, sights, mags and mounts. Below you will find 5 tables describing all modifications available in the game – their name, function and the weapons on which they can be mounted. S1897, S686 Decrease shotgun pellet spread, allowing more accuracy. S12K, AKM, M16A4, M416, SCAR-L Decrease vertical and horizontal weapon recoil allowing better continuous fire accuracy. Vector , Micro UZI, UMP9, Tommy Gun, Decrease vertical and horizontal weapon recoil allowing better continuous fire accuracy. Mk14 EBR, SKS, Kar98k, AWM, M24 Decrease vertical and horizontal weapon recoil allowing better continuous fire accuracy. SCAR-L, M16A4, M416, AKM Reduce muzzle flare – you become harder to spot. Additionally, slightly decrease weapon recoil. Vector, Tommy Gun, Micro UZI, UMP9 Reduce muzzle flare – you become harder to spot. Mk14 EBR, M24, AWM, SKS, Kar98k Reduce muzzle flare – you become harder to spot. 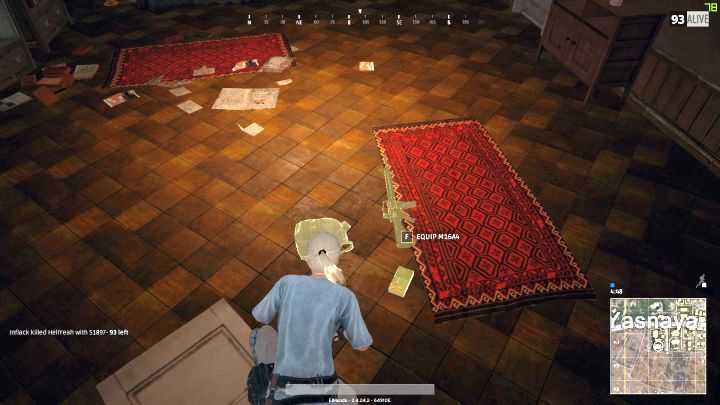 Groza, S12K, AKM, M16A4, M416 Reduces weapon noise, making you harder to expose. More about this – in the chapter devoted to suppressors. P18C, R1895, P1911, P92 Reduces weapon noise, making you harder to expose. More about this – in the chapter devoted to suppressors. Vector, Tommy Gun, Micro UZI, UMP9 Reduces weapon noise, making you harder to expose. More about this – in the chapter devoted to suppressors. Mk14 EBR, Kar98k, M24, AWM, SKS Reduces weapon noise, making you harder to expose. More about this – in the chapter devoted to suppressors. UMP9, SKS, SCAR-L, M416 Decrease vertical and horizontal weapon recoil allowing better continuous fire accuracy. SKS, Vector, SCAR-L, M416, UMP9 Decrease vertical weapon recoil allowing better continuous fire accuracy. Faster aiming. Kusza (Crossbow) Reduce crossbow reload time by 1 second. M16A4, M416, SCAR-L, SKS, S12K, M249, Kar98k, M24, AWM, Crossbow, Vector, Groza, Mk14 EBR, P18C, UMP9, AKM Adds a laser sight and provides faster aiming. M16A4, M416, SCAR-L, SKS, S12K, M249, Kar98k, M24, AWM, Crossbow, Vector, Groza, Mk14 EBR, P18C, UMP9, AKM Adds a holographic sight and provides faster aiming. Kar98k, M24, S12K, AWM, Groza, SKS, M14 EBR, SCAR-L, M416, AKM, UMP9, M16A4 2x zoom. Kar98k, M24, S12K, AWM, Groza, SKS, M14 EBR, SCAR-L, M416, AKM, UMP9, M16A4 4x zoom. Kar98k, M24, S12K, AWM, SKS, M14 EBR, SCAR-L, M416, AKM, M16A4 15x zoom. *Only available in supply drops. Tommy Gun Default Tommy Gun mag, contains 100 bullets. Groza, S12K, SCAR-L, M16A4, AKM, M416 Increases magazine capacity for these weapons. Vector, UMP9, Micro UZI Increases magazine capacity for these weapons. P18C, P1911, P9 Increases magazine capacity for these weapons. Mk14 EBR, M24, AWM, SKS, VSS Increases magazine capacity for these weapons. Groza, S12K, SCAR-L, AKM, M416, M16A4 Reduces reload time. Vector, UMP9, Micro UZI Reduces reload time. P18C, P1911, P9 Reduces reload time. Kar98k Reduces reload time for Kar98k. S1897, S686 Reduces reload time for S1897 i S686. Mk14 EBR, VSS, SKS, AWM, M24, Kar98k Decrease recoil for these weapons. Micro UZI Decrease vertical and horizontal weapon recoil allowing better continuous fire accuracy. Vector, M416 Decrease recoil for Vector and M416. Copyright © 2014 - 2019 SocksCap64, All Rights Reserved. Logos, Trademarks, Pictures Belongs To Their Respected Owners. Powered By WordPress. 74 Queries in 0.426 seconds.